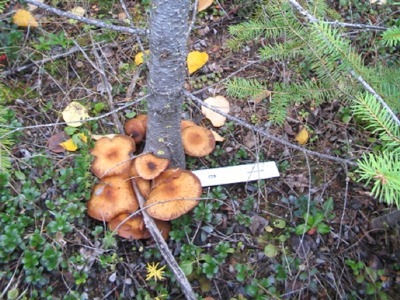 There are many reasons to take part in the free bounty of wild mushrooms we have in the Cariboo. First and foremost is that wild mushrooms are to the farmed mushroom as the tree picked peach is to supermarket picked variety, that is, unbelievably more flavourful. Other reasons for picking fall mushrooms include the diversity of kinds and flavours available, the excellent nutritional and health properties of wild mushrooms, and the very reasonable price (free). There is nothing that justifies a walk in the woods in the crisp fall air like a basket of delicious and free mushrooms to accentuate your fall feasting. One of the major obstacles facing the novice mushroom picker is overcoming the fear that your first harvest might be your last. The fungiphobic British Isles have instilled an unreasonable fear of mushrooms in many Canadians. While there are a few mushrooms in this area that can make you sick or worse, there are as many berries that will do the same. 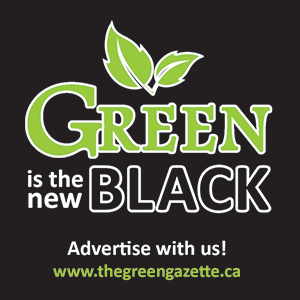 While most of us have a vague sense that poisonous berries do exist, we still feel quite comfortable eating our well recognized favourites such as Saskatoons or huckleberries. With that in mind, I have described five fall mushrooms below that are easy to recognize and very difficult to confuse with anything dangerous. Familiarize yourself with these mushrooms in a good book or online and you could have a great fall mushrooming season this year. 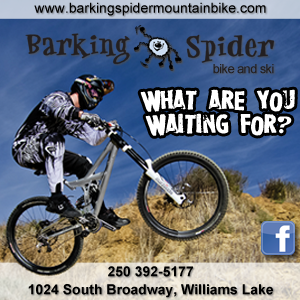 Leisure Services in Williams Lake will be organizing a fall foray and at that time you can get an experienced picker to confirm your identifications so that you are safely on the path to long years of enjoying another one of the bounties of rural life. 1. Shaggy mane (Coprinus comatus) – Delicious, plentiful, unmistakeable. 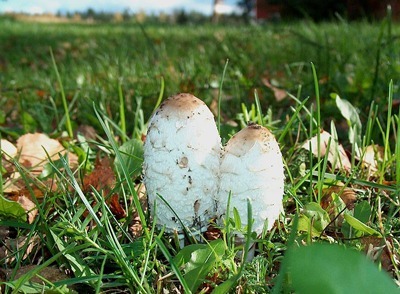 This mushroom grows on buried wood or other organic matter along logging roads, in old landings, in lawns, or on fields. As with all mushrooms, cut the dirty base off when picking to avoid getting grit in the close-packed gills, which are impossible to clean after the fact. Discard specimens that have started to turn pink, a precursor to turning black. Cook with salt in a medium pan to allow the water to come out. As the water starts to boil down, add cream and perhaps a few diced onions, and cook until the cream thickens. It does not get any better than this. 2. 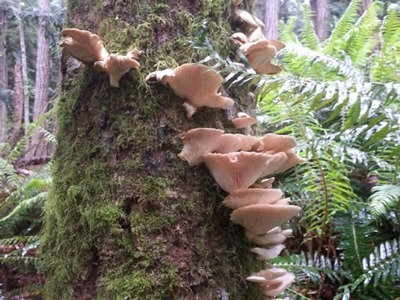 Oyster mushroom (Pleurotus ostreatus) – Arrives with the first fall rains when day length is around 12 hours, and fruits again in the spring during the same photoperiod. Photoperiod triggers fruiting in this mushroom. This flavour-charged cousin of the supermarket delicacy can be found growing in abundance on dead aspen in this area. When you find a producing tree it may yield for years, hence creating your first secret mushroom patch. This is a perfect illustration of the important role that dead trees play in the life of a forest (remember that many forest creatures eat mushrooms so leave some for them). Discard the tough stems, which won’t be dirty because they are growing on dead wood. Rip the mushrooms into half-inch-wide strips. Put in a hot pan with several tablespoons of peanut oil. Add salt and a little garlic. The heat should bring the moisture out of the mushroom to form a lovely, viscous broth, rich in umami taste and similar to a good chicken broth. Serve as a soup with mushrooms floating in the clear broth. 3. 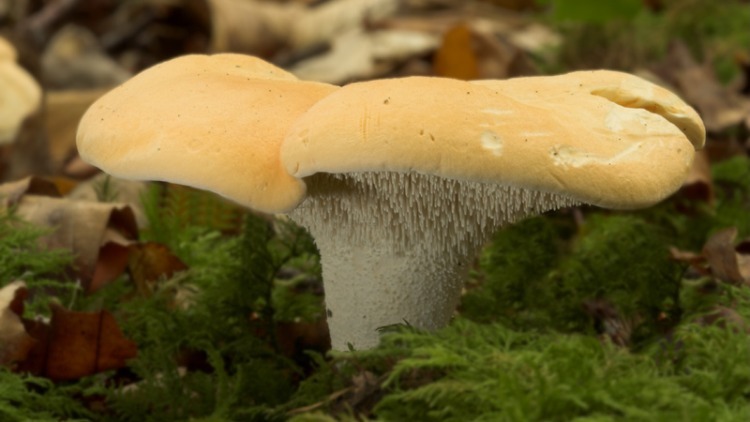 Honey Mushroom (Armillaria ostoyae and others) – Delicious, but so abundant around here that there is a tendency to overdo it. 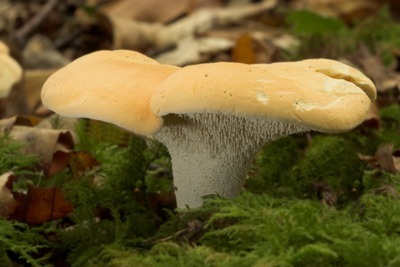 The honey mushroom comes out last of all, and is often found peaking through the first snowfalls of the year. It grows in clusters around the base of dead trees, which are the flag you look for to signal this mushroom’s presence. 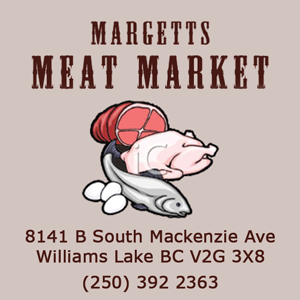 They can be found within minutes of Williams Lake in many locations, but not west of the Fraser. Discard the tough stems and use as a substitute for shian gu, the black mushroom ubiquitous in Chinese cooking. Dries well for later use. 4. Hedgehog (Dentinum repandum) – We don’t have chanterelles close to Williams Lake, but this little beauty tastes and looks similar—but better. It is found in mature pine stands, which the mountain pine beetle made scarce in the last few years. Look for it in the most mature (live) pine stands you can find. It starts in the summer and continues until mid-autumn. The pale to dark orange top and white spines instead of gills make this tasty morsel impossible to mistake. On those days when you don’t get your moose, pick a basket of these and come home to a warm welcome. The best way to cook all mushrooms is to sauté in butter with salt to taste. Nice, clean and simple; let the mushroom do the talking. Serve these with a grass-fattened beef steak or with your favourite shape of noodle. 5. Short Slippery Jack (Suillus brevipes) – I had to include one in the list that is a bit of an acquired taste. 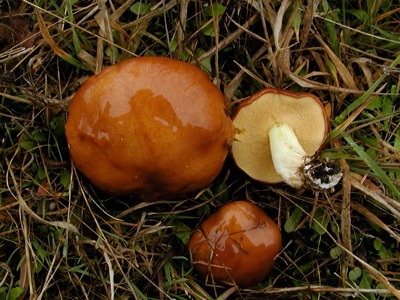 Like all Suillus, the short slippery Jack must be eaten in the button stage when it is firm and worm-free. Fortunately, this is easy to do because these babies are abundant under young pine stands, which can be found pretty much anywhere around Williams Lake right now thanks to the mountain pine beetle. These can be sautéed, but Polish people love to pickle this butter mushroom (as Europeans call it). Pickle in vinegar, pickling salt, and boiling water. Add varying degrees of onion, peppercorns, bay leaves, or garlic, as you wish. Eat these on their own or with herring salad for Christmas. If you familiarize yourself with the mushrooms above, for as much as it is possible to guarantee anything in this life, you will have a successful fall mushroom season this year and will go into the winter well fed and happy. Good mushrooming. 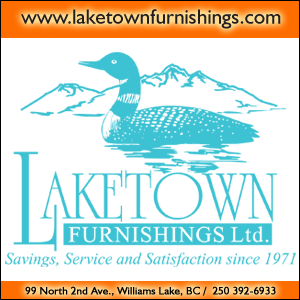 Bill and his family have lived in Williams Lake since 1992. They are frequently the only mushrooms pickers to be seen on the vast landscapes of the Cariboo-Chilcotin. Bill learned to pick mushrooms at his mother’s knee and Bill and Louisa’s kids all started picking mushrooms while still in diapers.